Cleanse Uninstaller Pro 5 was available as a giveaway on April 19, 2009! Cleanse Uninstaller Pro is a advanced uninstaller that finds and remove even the most stubborn of programs. Uninstall faster, easier and more completely than you do with other programs. Faster and cleaner PC system. Stop Adware/Spyware before it starts. Remove registry errors. Saves time and money. Save HD space and reduce need for costly hardware upgrades. I wonder if Cleanse Uninstaller can uninstall program really faster than usual. It is what I'm look for. Useful giveaway, anyways, I would stuck to my old good free software. Both programs have the same abilitys - its the customers choice. Useful giveaway, anyways, I would stuck to my old good free software. The <a>Revo Uninstaller</a>. Both programs have the same abilitys - its the customers choice. I've been trying to leave warnings about this program but I guess the moderator kept deleting them. It's a fatal mistake to install this. All of the thumbs up and positive comments are fakes. 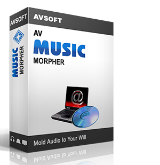 This worked well for me , I had a real stubborn program that I could not get rid of , this come along & got rid of it alright, good one. This worked well for me , I had a real stubborn program that I could not get rid of , this come along &amp; got rid of it alright, good one. To the fellow (#132 Roj BloughMeKoVidhch) who complained that Revo does not do anything much beyond the uninstaller .. actually what it does is clear and very helpful .. it finds folders with data files and registry entries that it believes were left over from the install and encourages you to make the final and careful determination before a delete. It isn't clear above whether Cleanse Uninstaller follows the exact same methodology, which it would be hard to improve upon. I will not install CU because of the file date concern which, if true, would make it somewhere between a bit of a bumbling and incompetent to a rogue program (GAOTD take note). Why in the world it would actually change any dates is the puzzle. It is actually hurting uninstall capabilities by changing dates, which, in a good program, can use the date information to link or separate files as from the same source. Putting in its own registry entries for each program, as reported, would also be quite a dubious action (and if so, are they found by another uninstaller ? - when uninstalling either the target program or Cleanse Uninstaller itself), totally unnecessary. However that at least does not have the tampering aspect of date changing. Roj makes a good point that all non-snapshot uninstallers should also be compared on how they handle "forced uninstalls" .. where there is no Add/Remove program available. This is relatively infrequent, but still important. Remember that a number of programs have their own special uninstall utilities .. remvoal tools. Java has the very excellent independent Javara, McAfee and Norton maybe some other AVs have special programs made by the companies in response to the outcry about the difficulties of an uninstall. I remember the difficulties in the old dates, some years ago, how Zone Alarm would keep a blocking firewall registry entry after its own uninstall .. this is the type of major problem that an uninstaller like Revo will likely find and prevent, since it scans the registry for specific-to-program entries. What I really like about Revo is it does nothing extra, nothing at all, without giving you a good tree-visual and asking you to confirm and act .. or pass by. Utilities>Junk Finder removes half of your "send to". I never used Revo Uninstaller, But I think it has more features than Revo Uninstaller, like Startup Manager, and the cool thing it has File burner that will delete your files securely! I dont often comment on programs from here, but this one I have to. I have had no success at all with this program. All it does is try to use the applications own uninstall program. Duh, I can do that myself! I need a program that uninstalls applications that wont uninstall themselves. Cleanse uninstaller simply fails because it doesnt do anything different than you can do yourself. It is no help with broken uninstallers. The program then locks up and crashes when it searches my registry (its 2nd step). The only way to end it is to use ctrl/alt/delete and windows task manager. I have tried it on 3 programs and no dice. Sorry GOTD, this one is worthless unless you are too lazy to find an applications uninstall program in the start menu. Keep the good ones coming however, we appreciate them! 5. Right click Activate.exe at the folder that you've extracted before, then click "Run as Administrator"
6. It'll activate your software. #109 "DOES NOT ACTIVATE ON VISA 64 BIT ULTIMATE"
Yeah, it doesn't activate on my Discover card either. prevented me from possibly making a costly mistake. #109 "DOES NOT ACTIVATE ON VISA 64 BIT ULTIMATE" Yeah, it doesn't activate on my Discover card either. #BuBBy. Thanks for your valuable comments, prevented me from possibly making a costly mistake. P8 : 0 P9 : system.typeloadexception "
So I uninstalled it, reinstalled it and got the same results! This is the first problem I have had with the download from your site. Are others having this same problem? Any suggestions what I can do? Is that the software company doesn't really want to participate in this? I downloaded, unzipped, read the 'read-me', installed software, activated it and I keep getting a Windows error to please send report3-4 times: "EventType : clr20r3 P1 : cleanse uninstaller.exe P2 : 5.0.0.0 P3 : 499f3272 P4 : mscorlib P5 : 2.0.0.0 P6 : 471ebc5b P7 : 1f49 P8 : 0 P9 : system.typeloadexception " So I uninstalled it, reinstalled it and got the same results! This is the first problem I have had with the download from your site. Are others having this same problem? Any suggestions what I can do? Is that the software company doesn't really want to participate in this? Thanks for any help you can give. Did all that - still makes no difference WILL NOT ACTIVATE ON VISTA 64. Period, end of story. Still no joy. #110 It changed my dates on Revo Uninstaller too. I did A system restore to 4-18-09 and the Revo Unistaller dates were change back to the original install dates. Hope this helps. Thank you 26 for the help, but it didn't work on my Vista Home Premium 64 Bit OS. I uninstalled and ran setup again as administrator, then tried running activate as administrator while the register screen was still up, after hitting continue and after exiting. NO GO on all of the tries, but after reading 29, it's probably just as well. I might give that Revo a try though. I'm wondering how one goes about going from X64 to 32 bit without deleting the entire drive and/or having to reinstall all of my programs. I would consider doing that if it were possible because I have run into so many program and hardware driver problems with X64, this being one, but perhaps a providential one. This program works better than Revo, it let uninstall other programs that I could not have done it with Revo Thanks a lot GOTD. I just realized that Revo has forced uninstall, but not on all programs (not sure why this is), you have to right click the program to see it. So far most have been GAotD programs that have the forced uninstall option (but not every GAotD program). Cleanse's force uninstall says it's for programs that don't have an uninstall option & asks you to fill in the program's name & browse to it's location. I kinda like this idea because I've been stuck with programs that didn't have uninstallers (or the unstaller was in the program folder & not shown in add/remove). Does anyone know if Revo's Hunter Mode does the equivalent? I just realized that Revo has forced uninstall, but not on all programs (not sure why this is), you have to right click the program to see it. So far most have been GAotD programs that have the forced uninstall option (but not every GAotD program). Cleanse's force uninstall says it's for programs that don't have an uninstall option &amp; asks you to fill in the program's name &amp; browse to it's location. I kinda like this idea because I've been stuck with programs that didn't have uninstallers (or the unstaller was in the program folder &amp; not shown in add/remove). Does anyone know if Revo's Hunter Mode does the equivalent? I found that Cleanse reset all but 2 program install dates in Revo too cleanse's install date (the 2 it didn't are listed as broken entries in cleanse) it lists 5 broken, but 3 of those don't show in Revo. The broken entries is a nice idea, but I'm not sure how accurate it is (I uninstalled & reinstalled a program with Revo & Cleanse still shows it as broken). Back to the dates...they show properly in Cleanse, but I'd really like to know why they change in Revo. It messed with the dates in Add/Remove Programs as well, but there are several dates listed (just not accurate install dates). The force unionstall is a nice idea, but I'm not about to test it seeing how it's messed with things so far. I uninstalled shockwave player (figured I'd keep it simple) with Cleanse & Revo, I got sightly different results, cleanse showed the Adobe folder (but unchecked) inside was the Director folder & SwDir.dll, bit not the Shockwave 11 folder, while Revo didn't show any folders. An novice user probably would have checked the folder in cleanse & delete what I believe is a shared file. Cleanse has a couple nice ideas, but I'm not convinced it's ready for prime time. I found that Cleanse reset all but 2 program install dates in Revo too cleanse's install date (the 2 it didn't are listed as broken entries in cleanse) it lists 5 broken, but 3 of those don't show in Revo. The broken entries is a nice idea, but I'm not sure how accurate it is (I uninstalled &amp; reinstalled a program with Revo &amp; Cleanse still shows it as broken). Back to the dates...they show properly in Cleanse, but I'd really like to know why they change in Revo. It messed with the dates in Add/Remove Programs as well, but there are several dates listed (just not accurate install dates). The force unionstall is a nice idea, but I'm not about to test it seeing how it's messed with things so far. I uninstalled shockwave player (figured I'd keep it simple) with Cleanse &amp; Revo, I got sightly different results, cleanse showed the Adobe folder (but unchecked) inside was the Director folder &amp; SwDir.dll, bit not the Shockwave 11 folder, while Revo didn't show any folders. An novice user probably would have checked the folder in cleanse &amp; delete what I believe is a shared file. Cleanse has a couple nice ideas, but I'm not convinced it's ready for prime time. better because of using it. Bottom Line: A good install for 32 bit WinXP Pro. Been using a number of utilities to find lost fragments of installs, and updated installs that left registry entries (like Glary free utilities, etc). Been fairly successful, but I found another 48 on my WinXP Pro laptop tonight after installing and running Cleanse Uninstaller Pro. This isn't by any means a "fool proof" software package, and there are a few "glitches" (like going to google.com.au as home base) - but it did find those wayward entries that no others found and allowed me to remove them one at a time. That was worth the download, and I don't care what anyone says that this is like "this" or "that" - this is free, it worked for me, and now my system runs better because of using it. Bottom Line: A good install for 32 bit WinXP Pro. Forgot...You also make a good point about the firewall, I come across this issue as well. Mike, Forgot...You also make a good point about the firewall, I come across this issue as well. Have you been reading my previous posts here? LOL. I always use Regshot and Universal Extractor. Universal Extractor is excellent for letting you know what files will be installed on your system. I never run a program after installation, I navigate to the installation directory, look over the files, mainly .ocx and .dll files. If they exist in the C:\windows\system32 directory, these *.ocx files change all pointers in the registry to that particular install directory. But, since these are self-registering files, when you exit the program you just installed, make sure the file is located in the system32 directory, and (for example), go to Start > Run and type regsvr32.exe mscomctl32.ocx. this will change all pointers back to the system32 directory . Now go back to the installation folder and rename that particular .ocx file to something like mscomctl32.ocx and execute the program. If the program runs fine with no errors, you can now safely delete that .ocx file. This also pertains to certain Dynamic Link Libraries (*.dll). One example is vbskit32.dll. If it's located in the system32 directory, rename it in the install folder and execute the program again. If it runs with no problems, again, it's safe to delete the file. Obviously these developpers don't understand how to properly script their uninstall program. This occurs in commercial software as well. 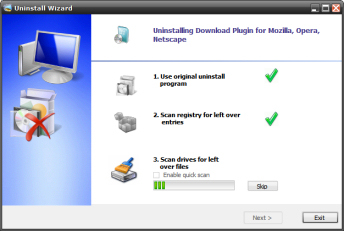 You have to download the Norton removal Tool to get rid of hundreds of registry entries and files left over from the poor uninstaller they use. Many times, I've seen particulate ActiveX controls (*.ocx files for those who don't know) being installed to the destination folder when most likely a newer version is already in the c:\windows\system32 directory. Not sure what you mean stating "if the set-up program is Macrovision for example, possibly insert itself to alter the way Windows runs." Could you enlighten me on that? As for this statement:----If a program needs for example .NET or the Visual C++ libraries, & if during install they’re not already installed, it will try to install them. Now the programmers can’t know if you’ll immediately remove their software, or do it 3 years or more down the road. If you’ve installed programs since then that also rely on .NET or those Visual C++ libraries, removing those as part of the program’s un-install would break every one of those programs that needed these resources.. This can be remedied by opening Regedit and navigate to the HKEY_LOCAL_MACHINE\SOFTWARE\Microsoft\Windows\CurrentVersion\SharedDLLs key. There are many entries related to the .NET Framework and I'm sure you're well aware of the C++ runtime names.. I alway up the count (increment) by at least 2 or more. This will prevent the situation you described. To the novice user, I'm sure this post seems intimidating, but why not copy and paste this post into a text editor and give it a try sometime. The following is only for the advanced user........... @96 - Mike, Have you been reading my previous posts here? LOL. I always use Regshot and Universal Extractor. Universal Extractor is excellent for letting you know what files will be installed on your system. I never run a program after installation, I navigate to the installation directory, look over the files, mainly .ocx and .dll files. If they exist in the C:\windows\system32 directory, these *.ocx files change all pointers in the registry to that particular install directory. But, since these are self-registering files, when you exit the program you just installed, make sure the file is located in the system32 directory, and (for example), go to Start &gt; Run and type regsvr32.exe mscomctl32.ocx. this will change all pointers back to the system32 directory . Now go back to the installation folder and rename that particular .ocx file to something like mscomctl32.ocx and execute the program. If the program runs fine with no errors, you can now safely delete that .ocx file. This also pertains to certain Dynamic Link Libraries (*.dll). One example is vbskit32.dll. If it's located in the system32 directory, rename it in the install folder and execute the program again. If it runs with no problems, again, it's safe to delete the file. Obviously these developpers don't understand how to properly script their uninstall program. This occurs in commercial software as well. You have to download the Norton removal Tool to get rid of hundreds of registry entries and files left over from the poor uninstaller they use. I also save a lot a space by deleting unnecessary language files which occur often with giveawayoftheday programs due to the foreign developers. I only keep folder and/or file names beginning with en or en-us Many times, I've seen particulate ActiveX controls (*.ocx files for those who don't know) being installed to the destination folder when most likely a newer version is already in the c:\windows\system32 directory. Not sure what you mean stating "if the set-up program is Macrovision for example, possibly insert itself to alter the way Windows runs." Could you enlighten me on that? As for this statement:----If a program needs for example .NET or the Visual C++ libraries, &amp; if during install they’re not already installed, it will try to install them. Now the programmers can’t know if you’ll immediately remove their software, or do it 3 years or more down the road. If you’ve installed programs since then that also rely on .NET or those Visual C++ libraries, removing those as part of the program’s un-install would break every one of those programs that needed these resources.. This can be remedied by opening Regedit and navigate to the HKEY_LOCAL_MACHINE\SOFTWARE\Microsoft\Windows\CurrentVersion\SharedDLLs key. There are many entries related to the .NET Framework and I'm sure you're well aware of the C++ runtime names.. I alway up the count (increment) by at least 2 or more. This will prevent the situation you described. Obviously I keep a clean machine and even Vista runs fine and (yes, fast as well.) To the novice user, I'm sure this post seems intimidating, but why not copy and paste this post into a text editor and give it a try sometime. For everyone so in love with "Revo" - let me remind you all of this fact... Revo does NOTHING except invoke the uninstall routine that comes with the software in the first place. NOTHING. Yes, it has a few other clean-up tools and so forth, but bottom line, if there's no uninstaller to begin with, Revo won't help you one bit. ALL IT DOES is invoke the existing uninstaller, and the only time it does something more than the program itself would do, is if the uninstaller won't start for some reason. It's a colossal waste of time. I don't know if this is any better, but it can't be any worse. Thanks Janet (#71) for the heads up on Revo showing and sorting by dates in its list mode. Thus, Revo shines again. And NirSoft can wait for now, on this program, since Revo is so kewl. Thanks Mike (#99) for showing a potential achilles heel of "snapshot" restores -- the installation of other auxiliary libraries like .Net or Visual C++ or Java or something. I will be adding this to the thread at DonationCoder, it really means you have to pay close attention to the install -- and only use the snapshot when you are satisfied that the install is straight-arrow. While this may be 95% or even 99%+ of installs, you could get real burned on that other one -- if you are not careful. Those types of semi-system programs are often not very happy to have slop, corrupted installs. And then you may have all sorts of difficult decisions as to the best way to rectify. For those who talk of System Restore (including Fubar above) and other ideas like imaging or Rollback or ERUNT registry saves .. none of these should be considered panaceas, and really should only be used with caution. And are more natural for the techies than for the regular user. In many cases you will have done a lot of other stuff before deciding on the uninstall, making all of those problematic at best, since you may have ten other installed programs subject to the Restore, the Rollback, the whatever. Plus all those methods are more complex and delicate and very subject to Murphy laying down the law, even if done immediately after an install. Most of the time the best way to uninstall is to .. simply uninstall .. use the right tools for the job. Whatever uninstaller came with the program, as used by Revo or ZSoft, and augmented by their findings beyond, which are nicely (at least in Revo) subject to your ok, and you should only say ok when you really see the program-entry connection. Or use the snapshot mode, if you made one and you are confident that other auxiliary stuff was not installed on the fly. Only in cases involving malware or real severe difficulties could I see the more laborious and difficult methods being very sensible. OK, I installed it, ran activation which said it was successful, yet it still came up and told me it was a trial version that would expire in a month. I looked at the "About" screen and there is indeed nothing there to indicate it is active and available. What gives? like many here, I am trying to revert back to my original install dates. I have uninstall Clease-uninstaller, have rebooted my (vista) system, have tried many times to do a windows system restore to many restore points, but to no avail, it gives me an error message every time. Request for help: hello, like many here, I am trying to revert back to my original install dates. I have uninstall Clease-uninstaller, have rebooted my (vista) system, have tried many times to do a windows system restore to many restore points, but to no avail, it gives me an error message every time. If some of you have succeeded, I would very much appreciate to know how, Thank you in advance, Bamboo. Now I have used it a few times. The only shortcoming so far is that it actually doesn't catch all remaining files. I did a search with Windows afterwards and it still found the one or other left-over file. Follow up to commend No.109) Now I have used it a few times. The only shortcoming so far is that it actually doesn't catch all remaining files. I did a search with Windows afterwards and it still found the one or other left-over file. Well I've just checked my installatio ndates in revo and Change/Remove programs and most of then have been changed to today! Please *DON'T* install this program until the programmer offers a new version of it.. Sorry to say this, but this program looks like an alpha one. Btw changing install dates will also make your restore points useless. If you still want to test run it make an image of your drive first! Please *DON'T* install this program until the programmer offers a new version of it.. Sorry to say this, but this program looks like an alpha one. Too many bugs.But it looks promising ... Btw changing install dates will also make your restore points useless. If you still want to test run it make an image of your drive first! Could not get this to work even with the GAOTD help above. It just refuses to register, right clicking & running as an administrator or not. It says the trial version runs out on 5/19/09. I really would have liked to compare this with Revo Uninstaller to see which is the better, but enough is enough. Free or not, after 7 times trying to get this to install and register correctly, I've had enough. Thanks anyway GAOTD, will wait for your next give away. Keep up the good work. Could not get this to work even with the GAOTD help above. It just refuses to register, right clicking &amp; running as an administrator or not. It says the trial version runs out on 5/19/09. I really would have liked to compare this with Revo Uninstaller to see which is the better, but enough is enough. Free or not, after 7 times trying to get this to install and register correctly, I've had enough. Thanks anyway GAOTD, will wait for your next give away. Keep up the good work. Not needed because every programz nowadays has its own uninstaller program... Thanks anyway Gaotd! It's appreciated. #104, Steven Block, I won't use RollBack Rx because it disables System Restore. Vista's use of volume snapshots is very sophisticated, and shouldn't be messed with. The top disk defragmenters, including Raxco PerfectDisk, will attempt to maintain Restore Points, and never mess up applications. Won't register on Vista Premium 32Bit! Activate.exe says "Successfully Registered", but the program still starts unregistered! #96, mike, I used to use Regshot, but it has numerous problems. It's buggy, slow, and there's no way to get a complete trace on Vista. On my Vista PC, InstallWatch Pro doesn't work, and when it partially worked, it took some ridiculous amount of time, half an hour or something. I use a previous giveaway (updated), Blue Project SysTracer (a home license is available). It has some bugs, but is generally pretty good. If stuff isn't in Vista's caches, it can take two or three minutes to snapshot my system, otherwise it generally takes less than thirty seconds (467,000 keys, 1,200,000 values, 34,000 folders, 336,000 files, 1,300 applications). Snapshot comparisons are essentially instant. Standard uninstalls can generally only delete newly-added files and registry entries. Changed and deleted items, particularly files, generally require System Restore or equivalent. #96, mike, I used to use Regshot, but it has numerous problems. It's buggy, slow, and there's no way to get a complete trace on Vista. On my Vista PC, InstallWatch Pro doesn't work, and when it partially worked, it took some ridiculous amount of time, half an hour or something. I use a previous giveaway (updated), <a href="http://www.blueproject.ro/systracer" rel="nofollow">Blue Project SysTracer</a> (a home license is available). It has some bugs, but is generally pretty good. If stuff isn't in Vista's caches, it can take two or three minutes to snapshot my system, otherwise it generally takes less than thirty seconds (467,000 keys, 1,200,000 values, 34,000 folders, 336,000 files, 1,300 applications). Snapshot comparisons are essentially instant. Standard uninstalls can generally only delete newly-added files and registry entries. Changed and deleted items, particularly files, generally require System Restore or equivalent. i click activate.exe but it keep getting me “Failed to Connect. Please try again later” why this happen? I had this problem in the past and discovered that my browser was "working offline" each time I had the "Failed to Connect" message I changed the setting to "work online," then ran setup.exe again and the activation went through in a few seconds. Downloaded & installed on my Vista 32 Home Premium quickly. No problem with activation. I always use "Run as Administrator" to run the installations, and I open the application only after I have activated it. Nice GUI, intuitive, easy to use. I used it immediately to uninstall a few applications that did not have uninstall features. All went well and quickly. A worthy addition from GAOTD. Downloaded &amp; installed on my Vista 32 Home Premium quickly. No problem with activation. I always use "Run as Administrator" to run the installations, and I open the application only after I have activated it. Nice GUI, intuitive, easy to use. I used it immediately to uninstall a few applications that did not have uninstall features. All went well and quickly. A worthy addition from GAOTD. Regarding program installation dates. I ran Revo and it did list all the program install dates as today. Then checked the program dates by right clicking and checking their individual properties tab and the dates are their own original install dates.???? Does this actually prove anything??? Tried all of the Run as Admin on Vista 64 and still won't register. Uninstalling it after spending over an hour on this one. Installed fine on my Windows XP machine. It was you who were clueless not Emsi. As I recollect you were an arrogant know-all without knowledge who would not send a file to Emsi for analysis. So of course Emsi were without a clue but it is you who is clueless. #52 Steven Avery, It was you who were clueless not Emsi. As I recollect you were an arrogant know-all without knowledge who would not send a file to Emsi for analysis. So of course Emsi were without a clue but it is you who is clueless. If the publisher cared, the problems pointed out in the forums would be properly addressed. This behavior of changing all the install dates AND resetting the System Restore Points is a definite problem. Many thanks to the people who actually tested and confirmed this action! I WAS interested, but I'll have to pass on this one!! Thanks to GAOTD for the offer! If the publisher cared, the problems pointed out in the forums would be properly addressed. This behavior of changing all the install dates AND resetting the System Restore Points is a definite problem. Many thanks to the people who actually tested and confirmed this action! I WAS interested, but I'll have to pass on this one!! Thanks to GAOTD for the offer! I tried to activate on Vista 32, the program said that it activated. It generated the usual link back to GOTD, but the program still says it is unregistered and will expire on May 19, 2009. About says it's unregistered also. I think this giveaway is only a short term rental. I installed/activated Cleanse and launched it right before I read the message about it changing install dates. I did not try to uninstall anything, simply viewed the UI and then exited. Like others, my install dates are changed to today. However not ALL are changed. Mysteriously, a group of them still have the original date, and all are from Hewlett-Packard. I was careless and didn't create a restore point either. Won't be doing that again. I've uninstalled. This is my first thumbs-down. wouldn't mention until now, but, circa 2-28-09 did a sys res and could not, lost IE6 capability to log on; had to install spare IE8 beta to recover; lost half my Gaotds since Nov., sys res won't always cover you, only maybe full disk imaging. Don't even try Admin setup on xp to play it safe doing net surfing either...it plays havoc with settings and all kinds of stuff and there's no restore point for that either...FULL BACKUP...maybe; they don't use bit parity check in chips anymore...DANGEROUS, they've eliminated the SAFETY quality assurance net, shield. #9 Dave Oakley...I wonder how these 4 in your opinion stack up to the vintage 1990s famed original UNINSTALLER of the sudden vanishing act; the one measuring up to it would seem to be the good choice. #29 re inhibited system restore on xp sp2: wouldn't mention until now, but, circa 2-28-09 did a sys res and could not, lost IE6 capability to log on; had to install spare IE8 beta to recover; lost half my Gaotds since Nov., sys res won't always cover you, only maybe full disk imaging. Don't even try Admin setup on xp to play it safe doing net surfing either...it plays havoc with settings and all kinds of stuff and there's no restore point for that either...FULL BACKUP...maybe; they don't use bit parity check in chips anymore...DANGEROUS, they've eliminated the SAFETY quality assurance net, shield. #9 Dave Oakley...I wonder how these 4 in your opinion stack up to the vintage 1990s famed original UNINSTALLER of the sudden vanishing act; the one measuring up to it would seem to be the good choice. I then rebooted and this dumb app had removed 2,500 operating systems files with it. No boot file, so luckily I spent 5 hour trying different things to repair, then found a legacy backup file from some time ago that saved my skin. I admit it asks you to make a backup, however thats pointless as if you cannot boot to windows you cannot restore the files. Installed fine on XP and Vista 32. Would not activate on Vista 64 anyhow. Comment: Win Ultilities which was offered as free give away of the day and has an uninstaller program in it. Tune Up Utilities 2009 has an uninstaller program in it. 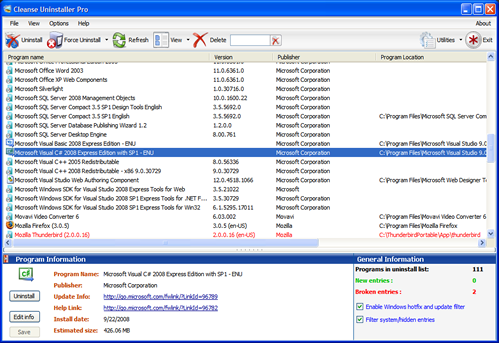 When things go wrong from an installed program, they are not always fixed by uninstalling the program, as there may be changes made in the computer that are not returned to the previous trouble free state. The easiest solution with excellent results is to have a Third Party Restore Point Program, that takes your computer back before the problem started. I have tried many such programs but the one that has worked like SOLID GOLD is Rollback Rx from www.horizondatasys.com. from unknown reasons, or just starts freezing. I just GO BACK to the beginning of the day or previous day. For information on my machine, I find it easier to back up work done to a external hard drive or Memory Key. The Program has a feature to exclude files in the back up for safety reasons, but if you have a lot on your computer, it will take too much time to manually select which files after Restore to save or not to save. Much faster take 30 seconds to back up new files in external memory and just go back hours or day or week or month; whatever. When things don't go right or computer will not start right, and you are stuck with the weak, anemic, awful vista system, use Restore Rx as turn computer on and it will show you the restore points you have selected back to months-whatevery you have configured. I have mine set to go back up to 2 weeks. I also have a couple of snapshots locked, so they will not be erased. in different Go Back programs. Be aware that defragmenting hard drive can mess up various major programs that are installed and you are using! When vendors say that defragmenting is safe, you really are doing it at your own risk and hardache.